The Old Town | Chinatown studio examined issues of “collective space and social space” as detailed in Herman Hertzberger’sSpace and the Architect, a series of essays on architecture which explore “in between space” and the city. 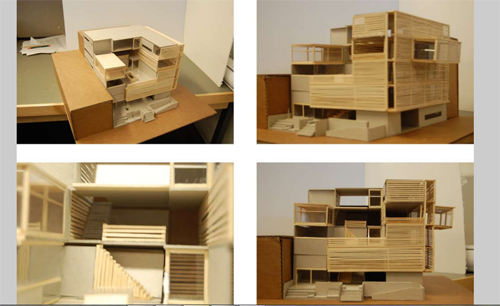 Offered in the fall of 2010, Professors Gast and Ho led an introduction studio for students in the Portland Option II Graduate Architecture Program. The studio combined aspects of architecture, urban design and the design of public spaces as all integral ingredients of what defines “urban architecture.” The studio addressed building tectonics as supportive and reinforcing to design concepts. True to the University of Oregon’s Graduate Program ideals, this course emphasized a comprehensive design process: the essential combination of theory, history, design skills, human factors, sustainability and tectonics (structure, construction and environmental systems) in design studio work. Sources of inspiration from student Dan Nowell's project. Given the Chinatown context and the importance of diversity, students also studied the writing of Richard Sennett, historian and sociologist. Sourcing Sennett’s works, The Conscience of the Eye, The Fall of Public Man and The Uses of Disorder, the goal was to observe and magnify diversity, obscurity and underlying pressures of metropolitan existence. By relying on Sennet’s perspective, students were encouraged to develop a city-vision where all people regardless of ethnicity or socio-economic background would have ample opportunity to interact and come into contact with one another in a designed environment. The primary objective would be to compel all individuals to experience their differences and semblances. This perception compelled students to create spaces where the humanity of this city would learn to co-exist and cooperate thereby fostering a “healthy tension” within the metropolis and, in turn, promoting a “healthy city”. 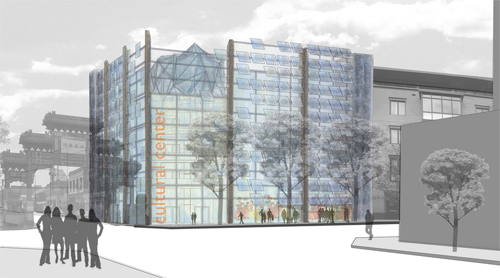 The Old Town – Chinatown Cultural Center is envisioned as a new public “catalyst” to advance regeneration of the Old Town-Chinatown neighborhood. Although Old Town – Chinatown has made solid progress on its revitalization during the past five years, the district remains a struggling corner of Downtown Portland. While Portland’s central Downtown and Pearl District have witnessed remarkable recent regeneration, Old Town – Chinatown has not kept pace with the rest of the city center in attracting new investment, activities, residents and visitors. Although public and private investment in the River District (the combined Pearl District and Old Town – Chinatown) has totaled well over $ 1 billion in the last 15 years, the district has a need for more public places, especially indoor public places that can be used in all seasons, in all weather, and at all times, day and night. Remarkably, the only major new indoor public place in this large district is the Armory Theater. North of Burnside and east of Interstate 405 (the approximate boundaries of the River District), there are no public libraries, community centers, recreation centers, major museums or cultural centers. 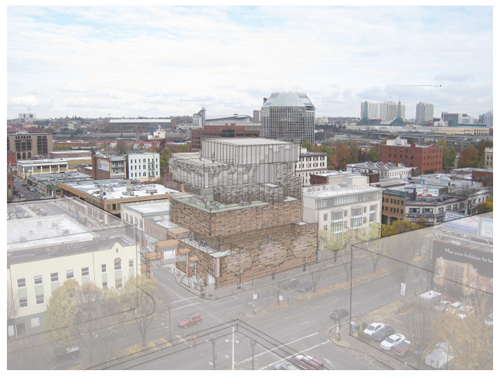 This poverty of “cultural infrastructure” has resulted in a somewhat monolithic district of affluent housing, high-end retail/commercial and expensive restaurants/entertainment uses in the western part of the River District – the Pearl District. In contrast with the upscale Pearl, a separate district of primarily low income housing and social services characterizes much of Old Town – Chinatown. This west-east gradient has produced separated social, economic and racial enclaves. The reasons for these planning shortcomings are numerous and complex, but the reality of the separated urban landscape is undeniable. Recent development projects, including the University of Oregon and Mercy Corps, have introduced major new attractions in Old Town – Chinatown. However, these are only partially public venues. A recent positive trend has been the opening of many new small businesses such as Floyd’s, several restaurants, and a healthy nightlife scene.. Despite the River District’s segregated social pattern, there is an opportunity to create a more integrated and diverse neighborhood (socially, economically, physically) within the remaining undeveloped areas of Old Town / Chinatown. One of the most opportune ways to accomplish this goal is to develop new public places open to all residents and used by all, places where people of diverse origins, social and status “rub shoulders”, see and meet persons unlike themselves, and participate in common activities and events. A cultural center with a strong participatory program can further this goal. Students were asked to create approximately 22,000 square feet that would incorporate an entry, a public event space, a multi-purpose or performance space, an exhibit or art gallery, a childcare center, a library area, a research and media lab, space for community education classrooms, a cooking studio, dance and drama performance studio, numerous small-scale work or meeting spaces, an administration office and a cafe. 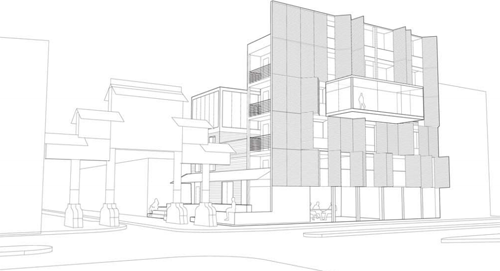 Designs were to consider realistic zoning frameworks and development standards. 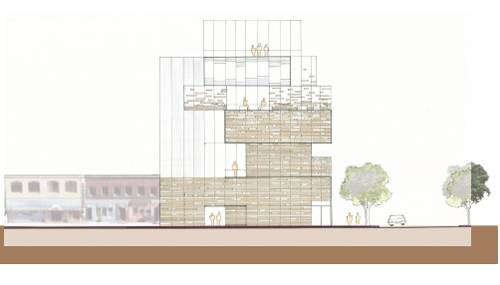 Meagan Dickemann's elevation and exterior view. 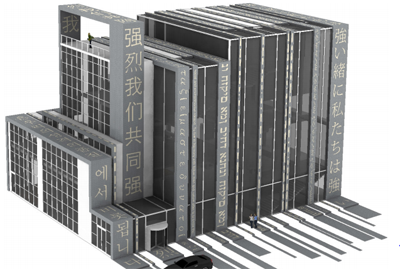 Adopting the requirements and suggestions for ancillary spaces such as a commercial bookstore, offices and space for the Northwest China Council offices, most students also made allowances for highly desirable site spaces like courtyards, rooftop terraces or other socially and physically pleasant outdoor spaces. 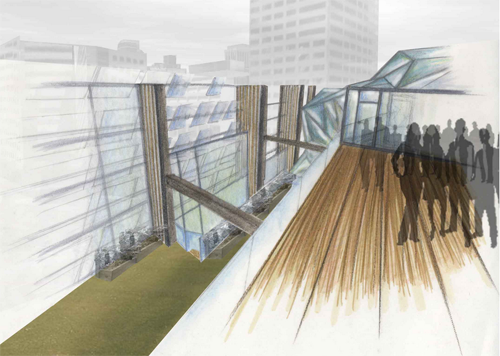 Dickemann's concept for rooftop terrace space allows for scenic enjoyment of surroundings. 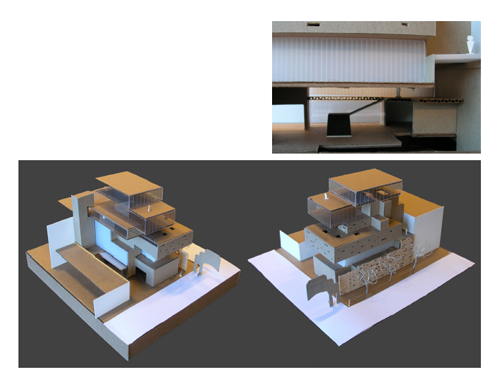 Dan Nowell's Architectural Ribbon Concept models. 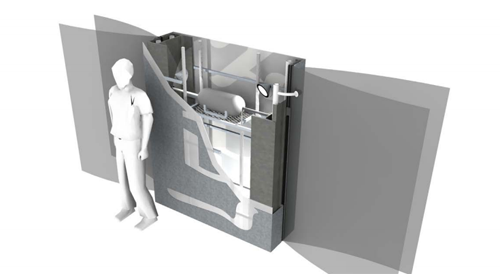 Ribbons are structural suppport, as well as housing mechanical, electrical and plumbing systems. Alex Jackson's models incorporate his "Stoop" concept. Mindful of sustainable design, Jackson’s proposal incorporates such elements as bamboo rainscreens and interior partitions, maximal daylighting, abundant southern exposure, natural light diffusion, water collection systems, natural ventilation, and accessible alternative transportation. Jackson relies heavily on the cultural connotations of the bamboo screens using this feature for both its sustainable advantages as well as its nod to the symbolism of the region. His concept relates a fusion of both environmental considerations and historical and cultural reflections. Jodi Hanson's Vertical Timeline-inspired structure in situ. Hanson sees her “disparate layers [as being] imperfect and, at times, unstable, creating drama with which the current community interacts.” Prior to creating her model and plan, Hanson engaged in an extensive study of the areas history. From this historical perspective, she developed a timeline of events definitive to the region and this helped shape her vision for the Cultural Center: it had to have “a lot of cultural history,” she said, “and this history had to evolve into other things…into this vertical timeline.” Hanson saw the history of the neighborhood as “being so much a part of the area” as to be a major influence in forming her urban plan; she also perceived of the “Chinese Lion gate” as one of the definitive features of this geography. Hanson's anchoring to surrounding rooflines and materials. Using the rooflines from the surrounding existing buildings to define the planes of her structure’s first and third floors, Hanson related the new Center to the neighborhood context and the built history of the streets. The terra cotta cladding she employed as her primary exterior material relates to the predominant use of warm reddish brick tones on the surrounding historical buildings drawing a connection both historically and physically to what already exists and what existed historically. Hanson's models for Old Town | Chinatown Cultural Center. Post | sabina. Thank you to the students, Alex, Dan, Jodi and Meagan for speaking with me about their projects and to their instructor, Professor Gast for providing information on the course.